Rukmini was the daughter of Bhishmaka, the king of Vidarbha. She fell in love with and longed for Krishna, whose virtue, character, charm and greatness she had heard much of. Rukmini’s eldest brother Rukmi was a friend of Kamsa, who was killed by Krishna, and did not want Rukmini to marry Krishna. Rukmini’s parents wanted to get Rukmini married to Krishna, but her brother did not. Instead, he wanted Rukmini to be married to his friend Shishupala, the prince of Chedi. 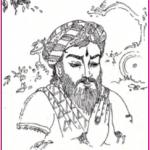 Shishupala was a close associate of Jarasandha, Krishna’s enemy, and an ally of Rukmi. Bhishmaka gave in to his son, but Rukmini, who had overheard the conversation, was heartbroken. She requested a brahmana to deliver a letter to Krishna. In the letter, she asked Krishna to come to Vidarbha and kidnap her to avoid a battle. She suggested that he do this when she was going to the temple before the wedding ceremony. Krishna, having received the message in Dwaraka, immediately set out for Vidarbha without informing anyone. Balarama heard about Krishna leaving, and guessing where He had gone, followed with a huge army. Meanwhile, Shishupala was overjoyed at the news from Rukmi that he could simply go to Kundinapura and claim Rukmini. Jarasandha, not so trusting, sent all his soldiers along because he felt that Krishna would certainly come. Bhishmaka and Rukmini received the news that Krishna had come. 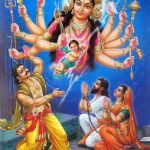 Bhishmaka secretly wished the Lord would take Rukmini away. He welcomed Krishna joyfully and made Him comfortable. Meanwhile, at the palace, Rukmini got ready for her upcoming marriage. She went to the temple of Kathyayani to pray but was unhappy when she did not see Krishna there. 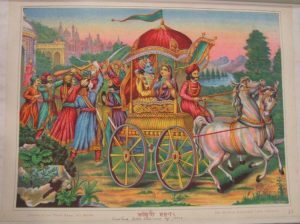 As she stepped out, she saw Krishna and He soon swept her into His chariot. All of Jarasandha’s soldiers quickly started chasing them. 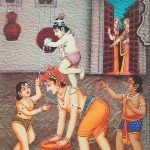 Balarama took most of them down, but Rukmi had almost caught up with Krishna and Rukmini. Krishna and Rukmi fought and as expected, Krishna won. When Krishna was about to kill him, Rukmini begged Krishna to spare Rukmi. Krishna agreed, but as punishment, shaved Rukmi’s head. 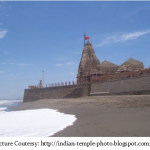 Krishna then took Rukmini to Dwaraka. There, Krishna married Rukmini very happily and ceremoniously.